The Detroit Pistons, playing without Blake Griffin, weren’t as fortunate. Love was out with a sore back for Cleveland after taking a hard fall in Saturday’s loss to Dallas, while Griffin sat out to rest for Detroit. Andre Drummond nearly made up for Griffin’s absence with 21 points and 21 rebounds, but Detroit’s center was also displeased with the outcome. “We tip-toed around with them the whole game, and they went out and took advantage of it,” he said. Sexton’s 3-pointer gave Cleveland a 115-114 lead with 1:54 left. Following a missed 3 by Wayne Ellington, Cedi Osman hit a 3 with 1:24 to play, putting the Cavaliers up 118-114. Detroit’s Reggie Jackson missed a 3 before Sexton knocked down another shot from behind the arc with 39 seconds left to make it 121-114 and complete a 10-0 run. 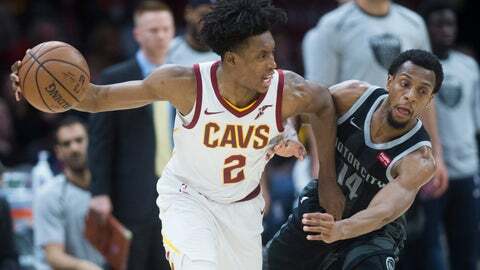 “Those are the moments people remember — end of the game and you make a big shot,” Sexton said. Casey is monitoring Griffin’s workload as the Pistons begin a five-game road trip that will take them to the West Coast. Griffin scored 25 points in 33 minutes Sunday. Cavaliers coach Larry Drew said Love was still sore Monday and didn’t participate in the team’s morning shootaround. Love has played in 12 games since returning from foot surgery. Drummond wasn’t paying much attention to the accomplishment.